A close look at the old photo of ribside caboose 991847 reveals all of the caveats of photography from a previous generation. No autofocus to help achieve a modern camera's clarity; slide film that saturates and leaves a tell-tale grain; no hyper-sensitive digital chip to rescue the contrasts of darks and bright whites. But like other old photos from ages past, there is something striking. The colors are robust and speak of a grand summer day from years ago. 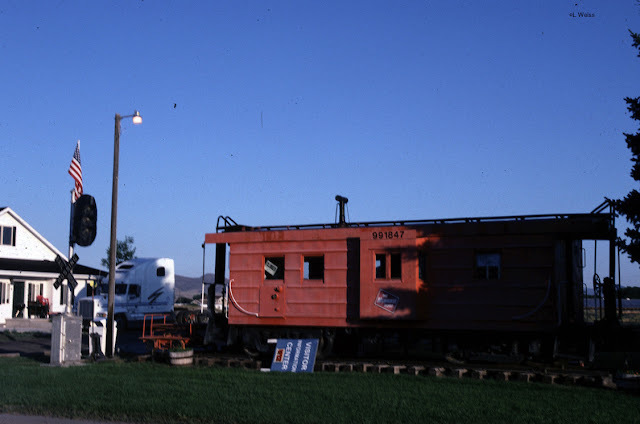 The orange caboose, though faded, still captures the imagination of passersby. Perhaps it is on its way out of town, bound for the summit of the Rockies as the tail to a westbound XL Special? Though the image is flawed, it seems to be timeless - at least to the one who shot it all those years ago back in Three Forks.